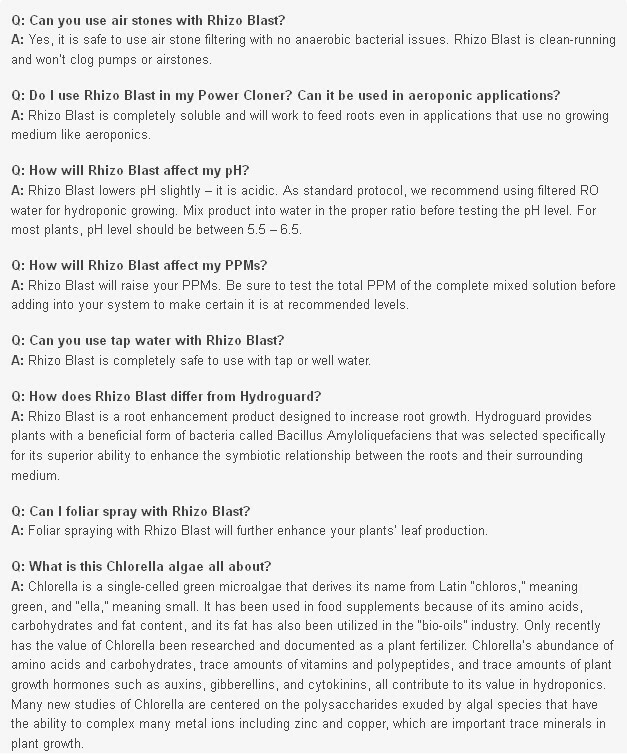 Rhizo Blast is a proprietary blend of seaweed and the single celled algae, Chlorella. 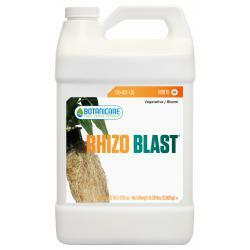 This particular form of Chlorella, the key ingredient in Rhizo Blast, is cultivated specifically for Botanicare. When combined with the other unique components in Rhizo Blast, this revolutionary formula encourages plants to produce an abundant root mass with lush, stacked foliage. Explosive root growth in the vegetative stage. Use with any growing medium, or hydroponic system. Ideal for use in transplanting. Promotes root branching and fine root hairs. 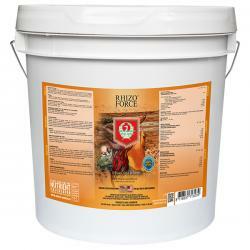 Enhances plant vigor in fast flowering plants. What is this Chlorella algae all about? Chlorella is a single-celled green microalgae that derives its name from Latin "chloros," meaning green, and "ella," meaning small. It has been used in food supplements because of its amino acids, fat content, and its fat has also been utilized in the "bio-oils" industry. Only recently has the value of Chlorella been researched and documented as a plant fertilizer. Chlorella's abundance of amino acids and minerals contribute to its value in hydroponics. Use Rhizo Blast after successful cloning has produced some established roots. Rhizo Blast was formulated to be used after initial roots develop in the seedling stage of a plant's life cycle. 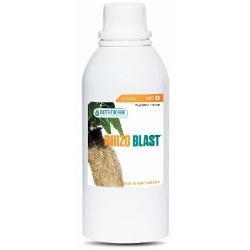 When used at 2 ml/gal, Rhizo Blast will promote vigorous root development enhancing overall plant growth. House & Garden Rhizo® Force is a granular slow-release product that enriches soil, coco and peat-based media with essential ingredients.